Use our effective public speaking subliminal message to improve your confidence, and help you to speak in any public or social setting. Do you hate even just the thought of public speaking? Do you worry for days, or even weeks in advance of having to give a presentation? Do you stutter, do you shake, do you sweat while you actually speak? Do you feel ill at the thought of having to speak? Whether you have to give a presentation at work, or as part of school / university, or even just a speech for a social occasion, our subliminal messages can help you. Instead of being terrified, you will start to see it as a challenge, you will see it as something you want to learn, and a burning desire to conquer your fear. Soon this will transform into you actually liking, and looking forward to the opportunity to speak, and even volunteering. It also works to help to calm your nerves. You will stop worrying, and your mind will stop racing and thinking of all the negative aspects of speaking. The subliminal messages will also start to change the associations you think of when you imagine yourself speaking. For example, in your mind's eye you will start to lose the images of you sweating, stuttering, and blushing. Instead you will think positively , you will see yourself calm and collected, speaking slowly and confidently, standing tall and smiling as you talk. Finally this album will also help you to focus your mind on speaking in the moment, on focusing on the here and now and help you to blank-out everything else. This is quite a fast acting album; if you listen to it just before you give a presentation you will notice yourself speaking more calmly, losing your nerves, and feeling more confident straight away. In time you will develop all of the skills which come naturally to a confident public speaker, speaking will become a non-issue for you - just something that you do naturally. 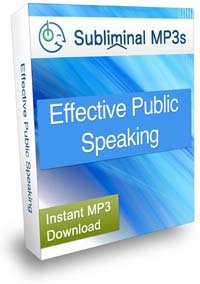 Download this album today; start making a powerful and lasting change in your mind and develop the ability to speak in public in any situation as if it is the most natural and effortless thing in the world.